Honestly, I thought there was no way I was going to be into this book. I haven’t read an Archie comic in ages. (Yeah, I read Archie comics back in the day. Shut up. They were fun.) But when I did, I always liked them fine. And yeah, I was a huge fan of the Predator movies. I actually liked the second Predator movie a bit more than the first, but that’s a whole different discussion. I really had no idea how Alex de Campi was going to make this mash-up work. But you know what, people like peanut butter and pickles, so I’ll give this a go. Besides, I had heard good things about the Afterlife with Archie book that was out a while back so I thought, why not? I must say, I’m completely cool with this marriage for several reasons, not the least of which was the art of Fernando Ruiz. I have to say, this looks like an Archie book should. So hats off to you Fernando, this book looks exactly the way it should. 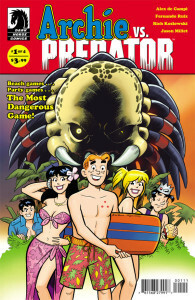 But I’m telling you, Alex de Campi hits it spot on with working Predator into the life of Archie by not trying too hard. Alex manages to stick with the familiar tropes of both these properties and they happen to work really well because of it. The Archie gang doesn’t veer off into weird sci-fi-esque stylings of the late ‘80’s/early ‘90’s action films. And Predator isn’t watered down and repositioned as an alien teen infatuated with Veronica. The Predator is the Predator. He hunts people down. And yes, he hunts folks down in the first issue and collects his trophies. (Skull and spine for those of you wondering.) And the scene where you discover this is appropriately gruesome. And even though this is an Archie comic, you get to see two corpses hanging upside down from a tree… one with no head. 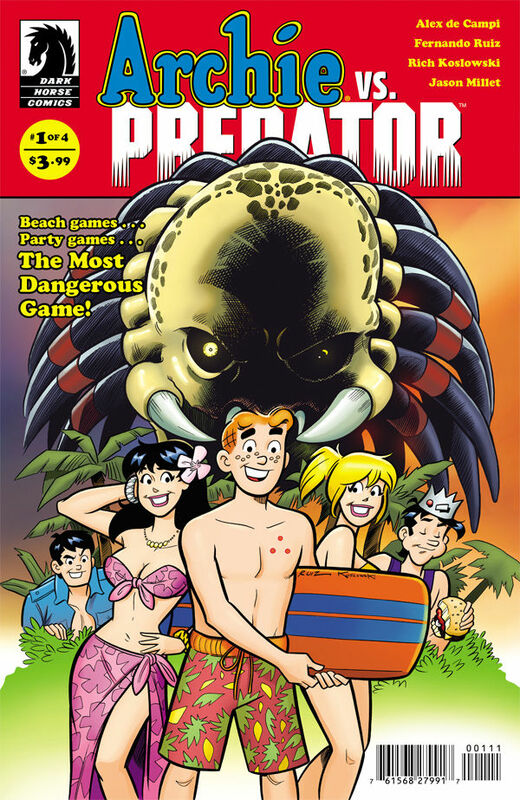 This is exactly what you would expect if Predator killed some folks in Archie’s world.